Santoro Masonry rooted in Bethlehem, Connecticut specializes in custom stone work design, construction and reconstruction. We can design and create one of a kind structures that enhance the natural beauty of your home or landscape. We can also reconstruct existing features that have become weathered or damaged over the years, restoring their vibrancy and functionality. We take enormous amount of pride in our hard work and dedication. Our skills and passion for masonry show in every project. Our hands on approach helps us connect with our clients and create amazing designs time and time again. The picture below tells much of the story behind our company. The man in the photo is Charles Volage, my step dad, and one of the best masons ever born. I started going to work on jobs with him when I was very small. I could feel the love he had for what he was doing even then. One of his favorite sayings was to treat people the way you would want to be treated – to treat someone’s home just as if it was your home. Back then, he worked mostly as a sub-contractor for Scott pools in Woodbury, CT, doing stonework and decks around their pools. I grew up in an atmosphere where people really cared about what they did and had pride in their work and instilled it in me. High quality work was something that was expected each and every day, with no excuses. 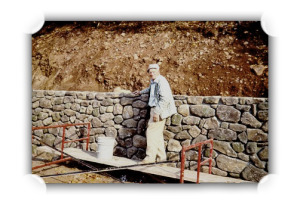 After graduating Kaynor Technical School in 1977, I began to run our modest masonry company full time, with Charlie’s guidance. In the beginning, I would sometimes think he was too fussy, too demanding, often not happy with a project until it was as perfect as could possibly be. Now looking back on those times I smile, because now it’s me that people say that about. I have this desire, almost to a fault, to do every job as perfectly as possible. I guess Charlie’s smiling down on me. Charlie Volage died in 1990. I still miss him every day of my life, but I am also very grateful to him, to have learned from him, to have known him. Today we are a full service masonry contractor, dedicated to the highest quality possible. And after 26 years, my business number still rings in my home.